Used Packaging Machinery and used Packaging Equipment specialist. High Performance Packaging is your one stop shop for custom turn key packaging lines. High Performance Packaging has 30 years of experience building used packaging equipment packaging lines for just about any packaging needs. Click on the link to the left under Used Equipment to find the used packaging machinery and used packaging equipment you are looking for. All of our packaging equipment is ready to run, we rebuild onsite to ensure the equipment is fully operational when it arrives at your location. We are the best when you are looking for used packaging machinery. High Performance Packaging specializes in Used packaging machinery and Used packaging Equipment. High Performance Packaging can build an entire Used Packaging machinery line to suit your needs. Below are just some of the used packaging machines and used packaging equipment we specialize in. Used Hayssen Packaging Machines, Used Ket Technologies ISO-FLo vibratory feeders, Used Matrix Packaging Machines, Used Rovema Packaging equipment, Used Bartelt HFFS packaging machinery, Used Triangle VFFS Packaging machinery, Used Woodman Polaris packaging machinery, Used Ishida Scales, used Yamato Scales, Used All-Fill Auger Fillers, Used Safeline Metal Detectors, Used Fortress Metal detectors, Used Weighpack scales, Used Combi scales, Used Ilapak VFFS packaging machinery, Used Viking VFFS packaging machinery, Used Schebler Tumblers, Used AMS Auger Filling equipment, Used Kason sifters, Used Sweeco sifters, Used Dumpers Unlimited Tote Dumpers, Used Econoseal Packaging equipment, Used Markem X40 and X60 printers, Used Videojet 6420 printers, Used Finger lakes Conveyors, Used heat & Control Packaging machinery, Used Heat and Control Fastbacks 260E, 90E, 200A Fastbacks, Used Mettler Toledo Checkweighers and Mettler Toledo Metal Detectors, Used Eriez Vibratory Feeders, Used Smalley Bucket Elevators, used Frazier and Sons Z Bucket Elevators Whiz Lifter, Used Deamco Bucket Elevators, Used mateer Burt auger fillers, Used Hinds Bock Piston Fillers, Used Bosch Packaging Technologies packaging machinery, Used Spee-Dee Fillers, Used Doboy packaging equipment, Used HMC Horizontal Packaging machinery, Used TNA Robag packaging equipment, Used LOCK Metal Detectors, Used Loma Metal Detectors, Used Weighpack Swifty baggers Swifty junior, Swifty 1200 Swifty 3600, Hayssen Ulima, Hayssen Novus, Yamato ADW scales, Used Ishida CCW scales, Used KHS bartelt HFFS packaging machines, Used Meyer Bucket Elevators, Used Allen Systems Bucket Elevators, Used Dorner Conveyors, Used Moline Machinery Conveyors. 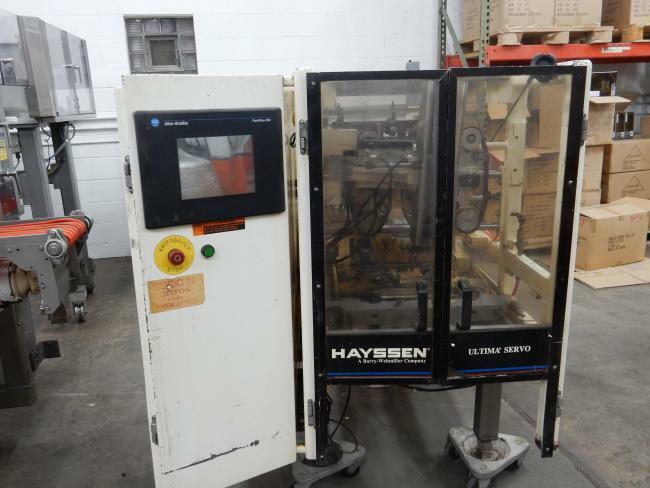 Used Hayssen 8-16SV packaging machine for sale!! !